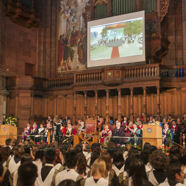 the use of virtual worlds for teaching, research and outreach related to the University of Edinburgh. 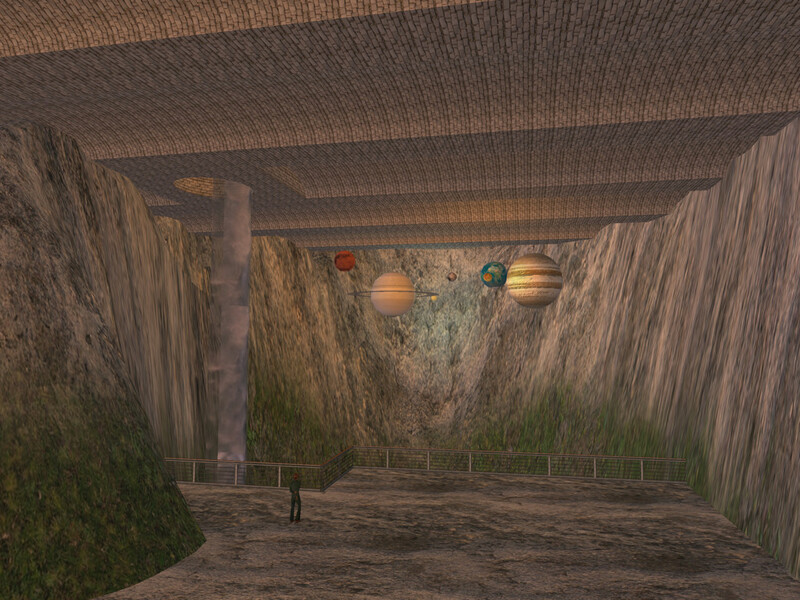 2019-03-31 - Second Life Vue region now removed. 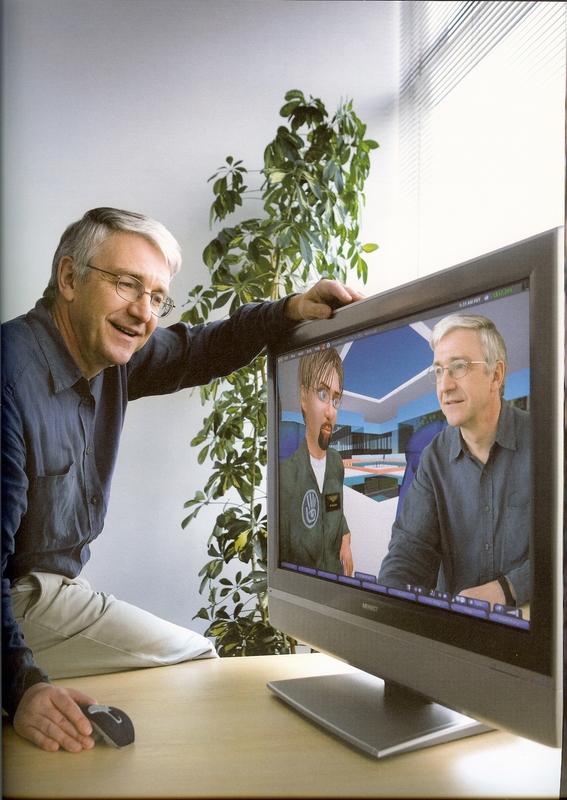 Vue meetings can continue to be arranged on a Second Life Sandbox region or in OpenSimulator-based OpenSimulator grids [Blog Post]. 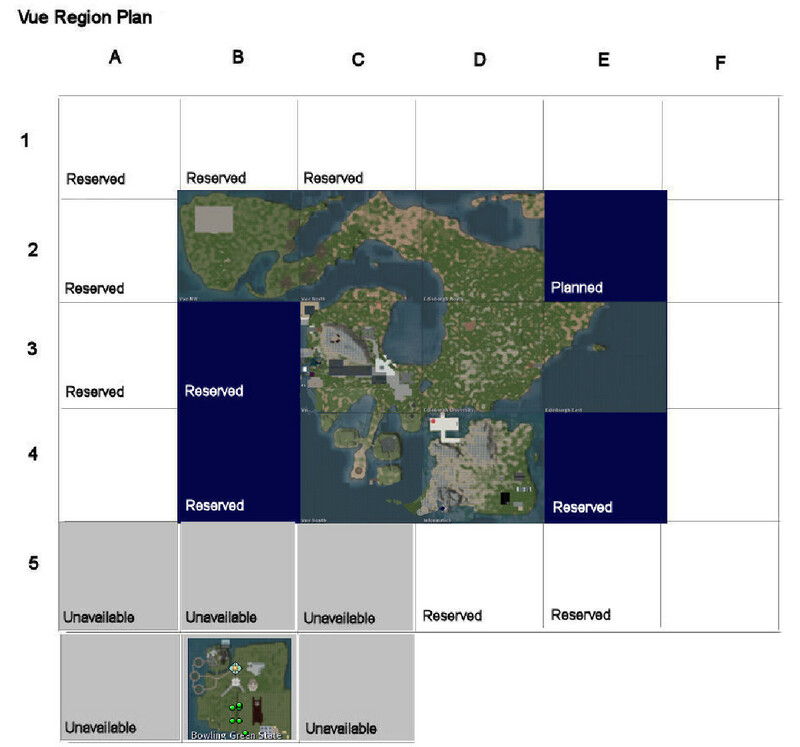 2018-06-15 - Openvue grid "Vue" regions as they appeared in Second Life around 2010 now available on OpenSimulator-based OSGrid. Lookup "Vue" in the viewer map. 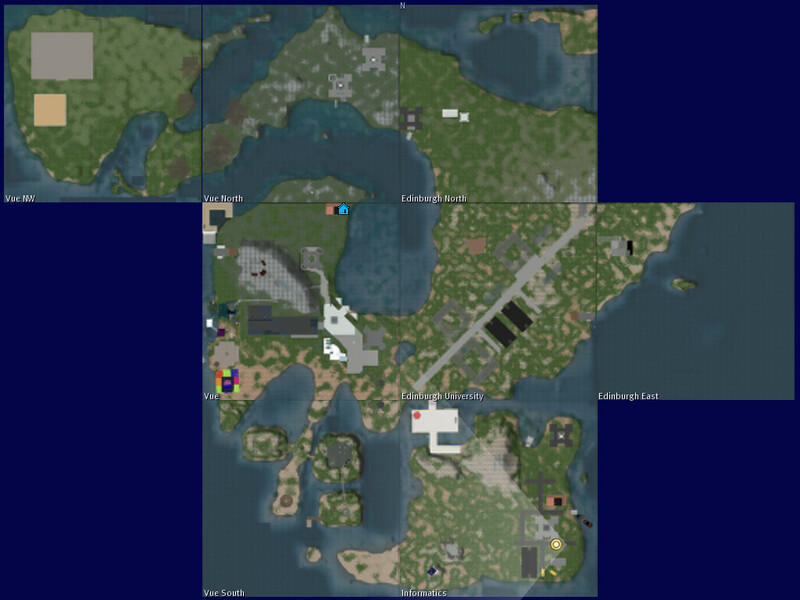 2017-11-30 - Most Second Life regions now removed. 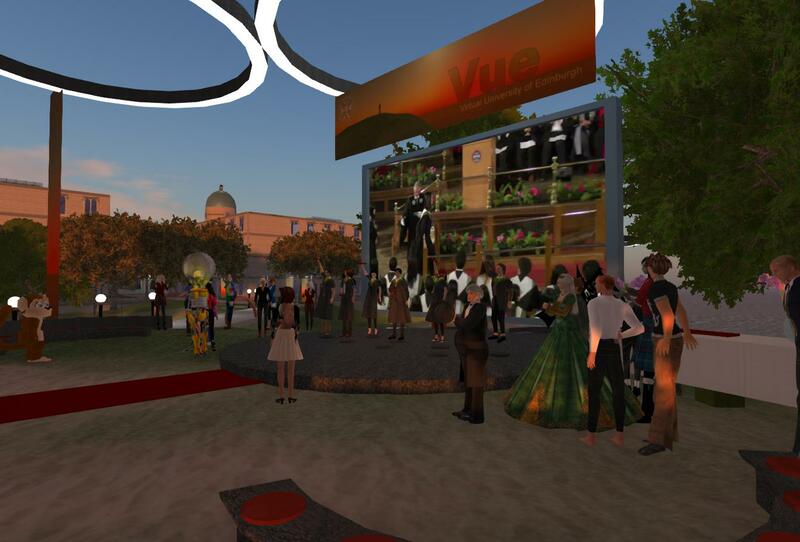 Vue meetings can continue to be arranged on a Second Life Sandbox region where facilities such as a replica of The Venue@Vue can be rezzed. 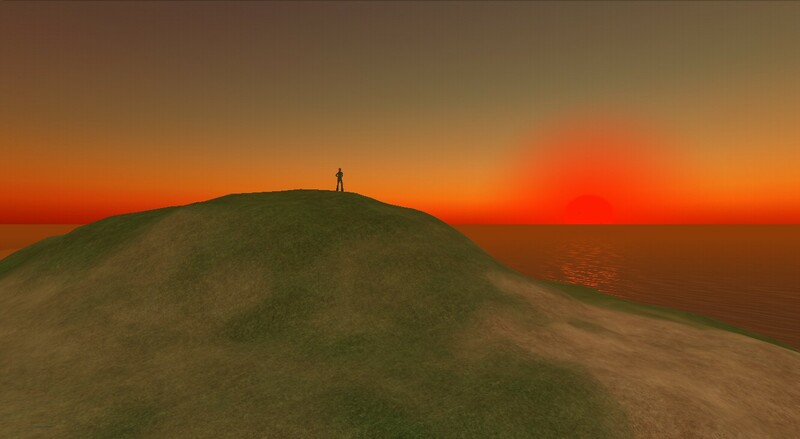 The Vue regions as they appeared in Second Life are also replicated on the OpenSimulator-based Openvue grid and can be visited by anyone with a Hypergrid-enabled OpenSim grid avatar (such as an OSGrid avatar) [Blog Post]. 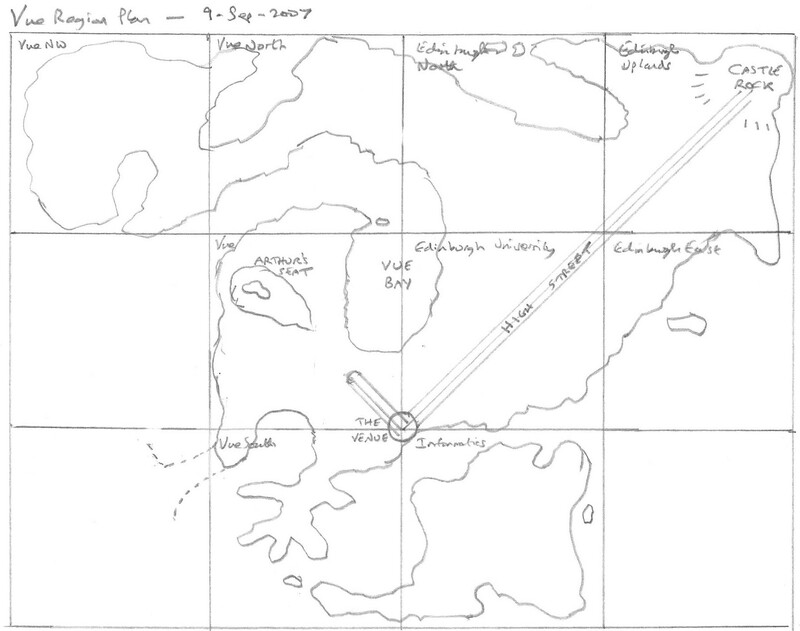 2017-07-03 - AiLand moved onto new Windows 10 server coll.aiai.ed.ac.uk alongside tiree.aiai.ed.ac.uk. 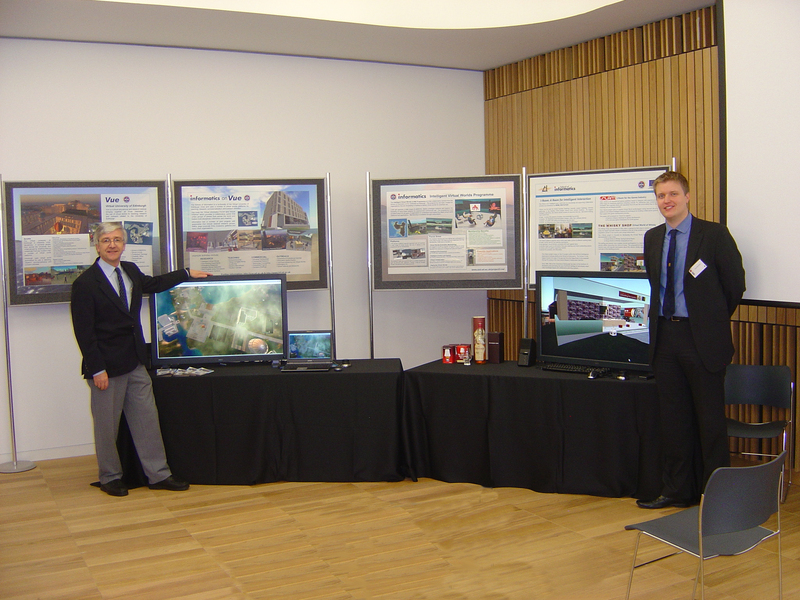 2017-06-06 - Openvue moved onto new Windows 10 server rona.aiai.ed.ac.uk alongside struay.aiai.ed.ac.uk. 2017-01-01 - Vue regions open on the Sinespace platform for experimentation [Blog Post]. 2016-10-24 - Openvue and AiLand running in OpenSimulator 0.9.1 in Grid Mode. 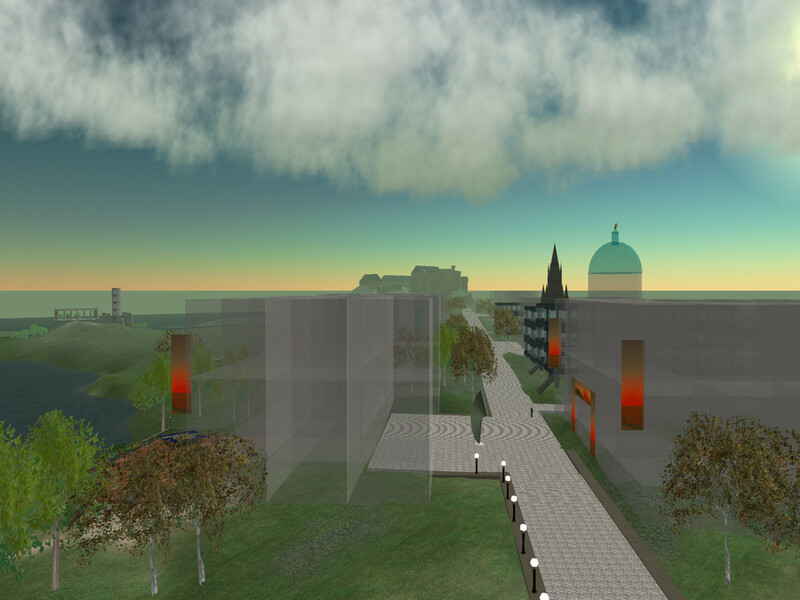 2016-09-23 - Vue Landmarks Restored on Edinburgh University region in Second Life [Blog Post]. 2016-07-25 - Openvue moved onto new Windows 10 server rona.aiai.ed.ac.uk alongside virtual1.aiai.ed.ac.uk [Blog Post]. 2015-11-24 - Openvue and AiLand running in OpenSimulator 0.9.0 in Grid Mode. 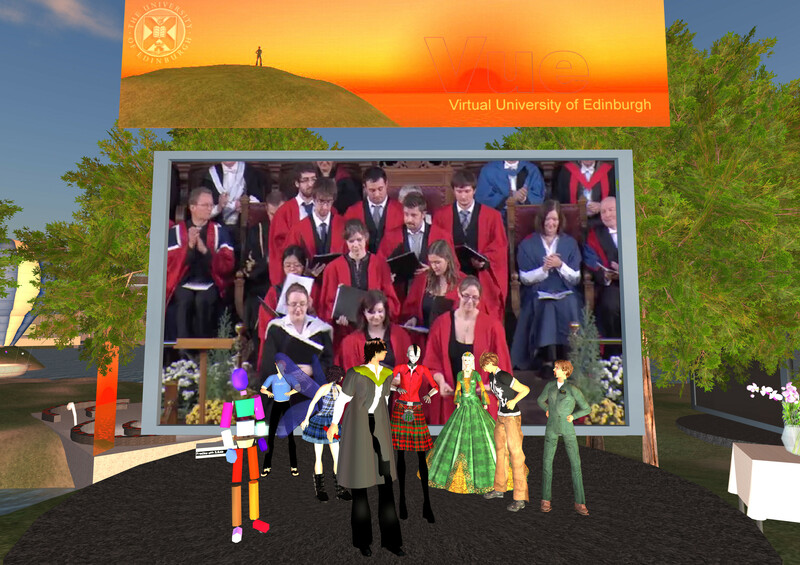 2015-11-04 - Second Life facilities on "Edinburgh University" region moved onto core "Vue" region. 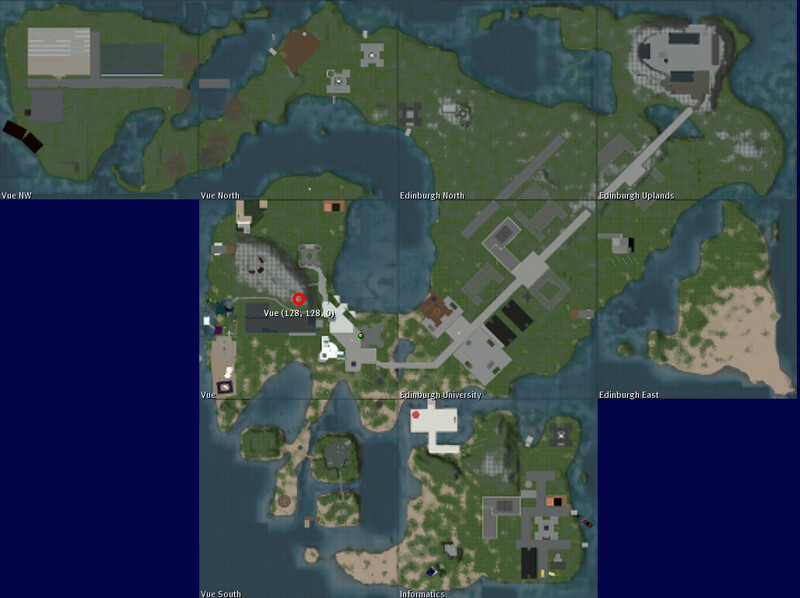 2015-10-19 - Openvue and AiLand running in OpenSimulator 0.8.3 in Grid Mode. 2015-03-17 - Openvue and AiLand running in OpenSimulator 0.8.2 in Grid Mode. 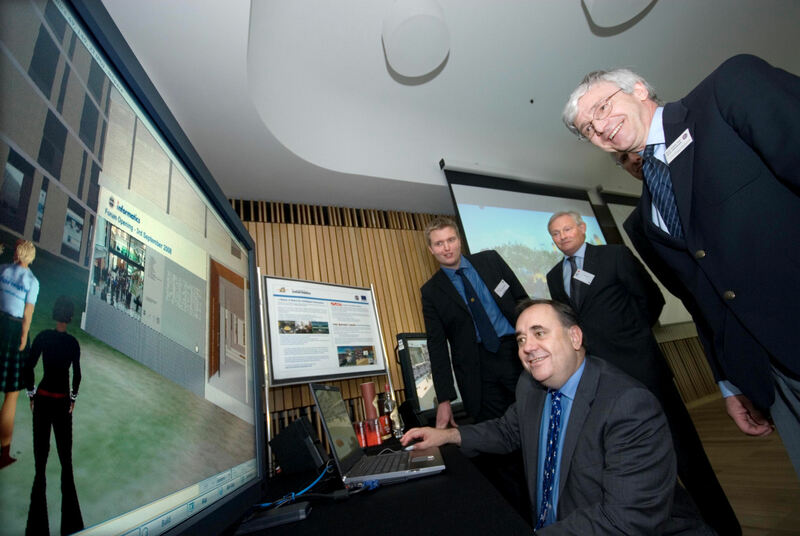 2014-07-11 - Rebuild of Veterinary Studies area on Edinburgh East. [Blog Post]. 2014-06-18 - Openvue running in OpenSimulator 0.8.1 in Grid Mode. 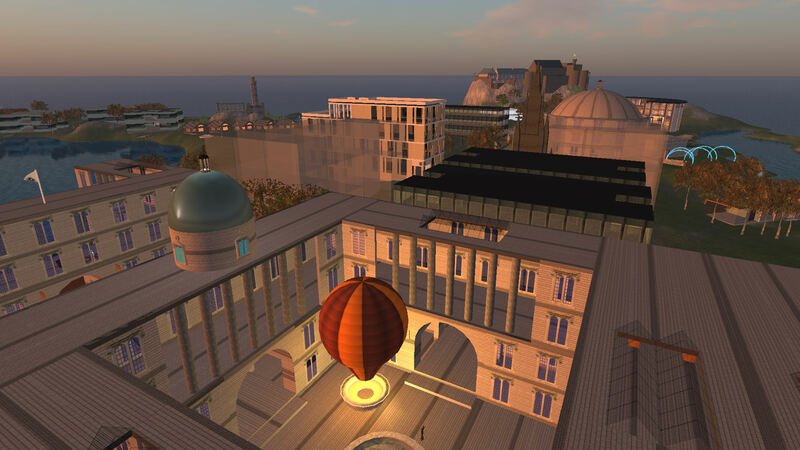 2014-05-15 - OSGrid Vue regions moved onto new server eriskay.aiai.ed.ac.uk alongside virtual4.aiai.ed.ac.uk. 2013-10-05 - Openvue running in OpenSimulator 0.8.0 in Grid Mode. 2013-05-16 - Openvue grid main "Robust" services and core regions (Openvue, OpenVCE, Sandbox and Vue-5000 hypergrid jump region) moved to new Windows 8 server (virtual0.aiai.ed.ac.uk). [Blog Post]. 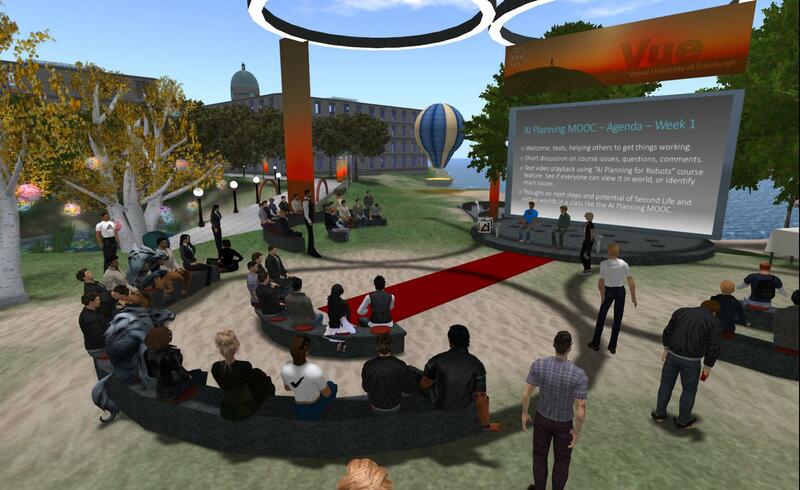 2013-05-09 - Openvue grid moved from grid location near 1000,1000 to near 9050,9050 for improved Openvue-OSGrid interchange. 2013-02-05 - Openvue running in OpenSimulator 0.7.6 in Grid Mode. 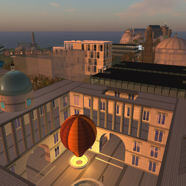 2012-09-10 - OSGrid Vue regions moved onto new server virtual4.aiai.ed.ac.uk. 2012-09-03 - Openvue running in OpenSimulator 0.7.5 in Grid Mode. 2012-03-22 - Openvue running in OpenSimulator 0.7.4 in Grid Mode. 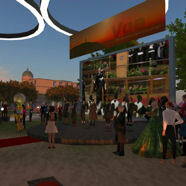 2012-01-16 - Vivox voice services available on the OpenSim-based Openvue and OSGrid Vue regions. 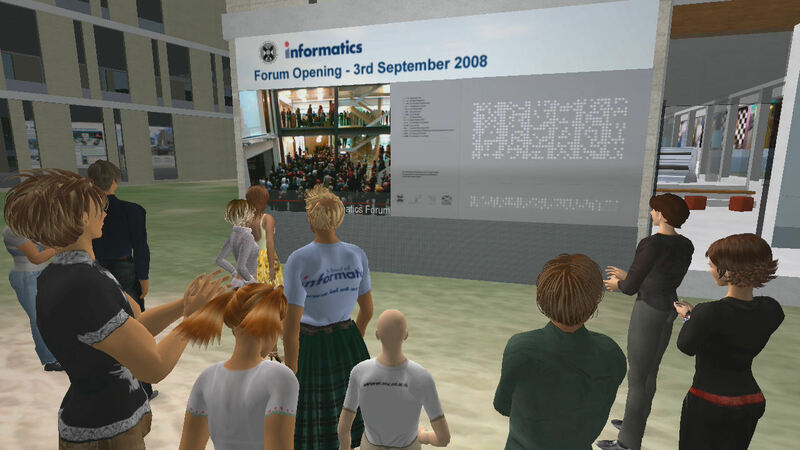 6-Jun-2011 - Informatics and Edinburgh North regions in Second Life now removed. 12-Oct-2010 - Edinburgh Uplands region in Second Life now removed, with the castle moving to the NE corner of Edinburgh University. 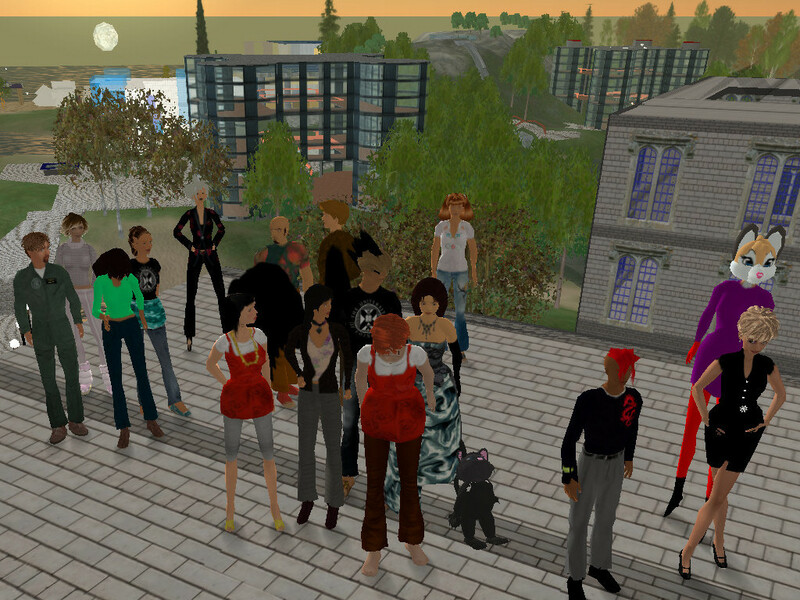 19-Jun-2010 - Openvue running in Opensim 0.7 in Grid Mode on virtual.aiai.ed.ac.uk. 22-Nov-2007 - Vue Christmas Lights On event. 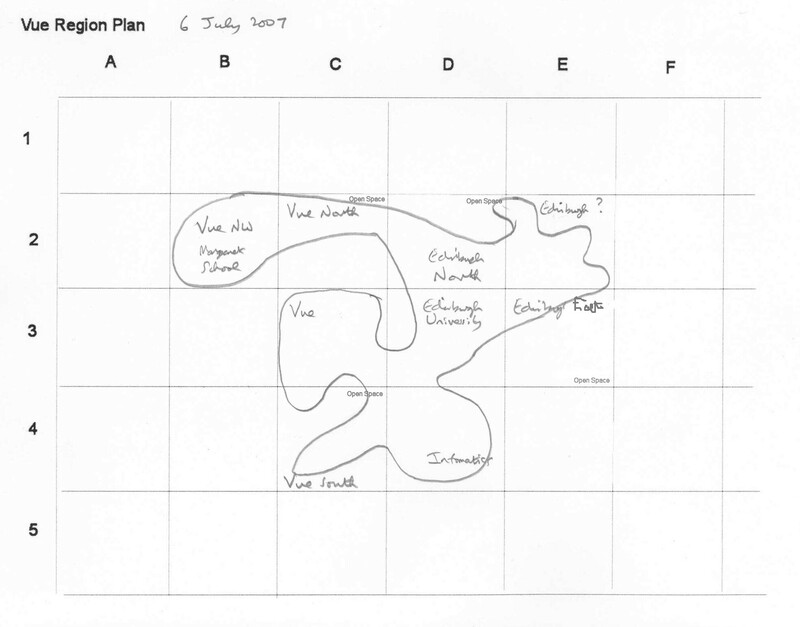 2-Aug-2007 - Four "open space" islands added: Vue North, Vue South, Edinburgh North and Edinburgh East. 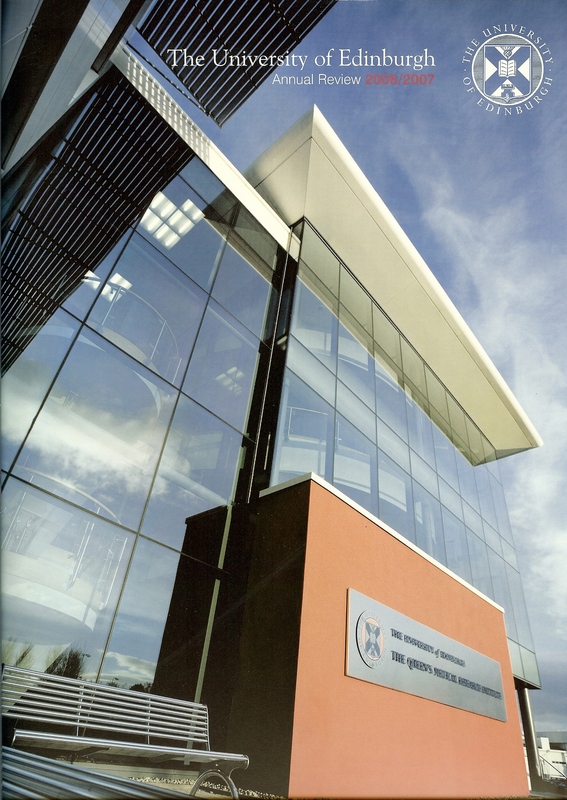 School specific regions added for the Schools of Management and Informatics. 20-Jun-2007 - Vue East now available. 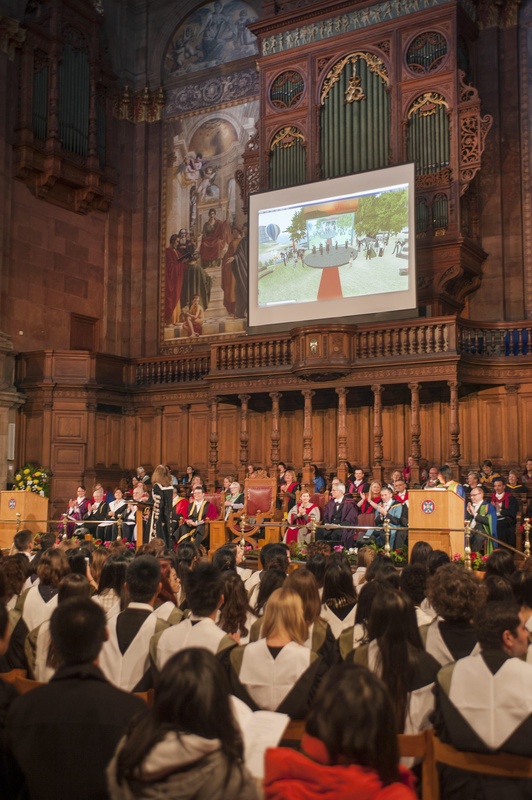 Since renamed to "Edinburgh University". 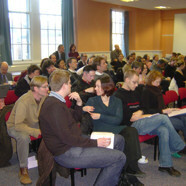 28-May-2007 - Initial facilities on Vue available and active. 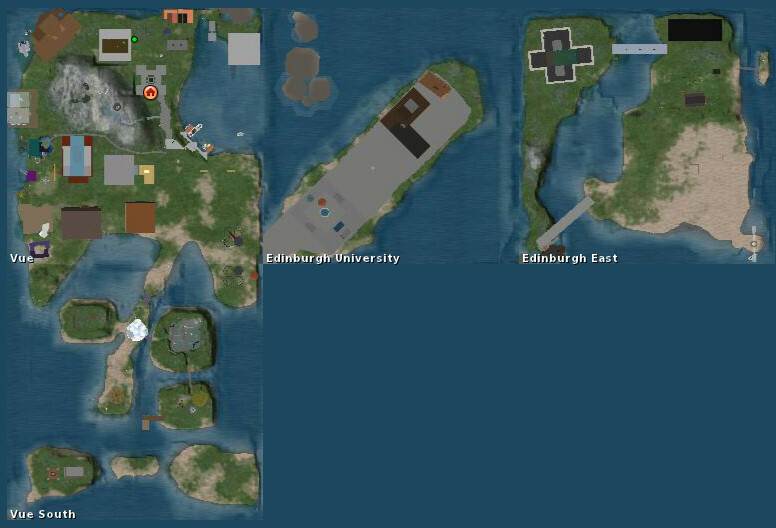 See Map of Whole Second Life World, Vue off West Coast of Southern Continent and Position of Vue to other educational establishments in vicinity. 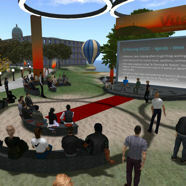 20-Apr-2007 - Initial meeting of the "Vue Maintenance" group to begin development of the Second Life Vue island. 10-Apr-2007 - Second Life island with name "Vue" available with Fiona Littleton of Education making the arrangements. 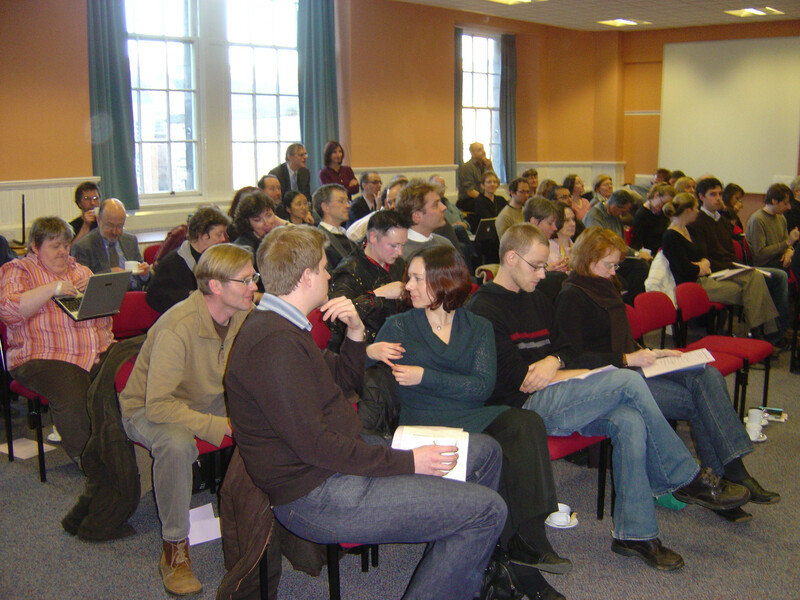 29-Mar-2007 - A Vue Wiki (password needed at the moment) is being created as a pilot project under the University of Edinburgh Central Wiki Service which uses the Confluence Wiki Software. 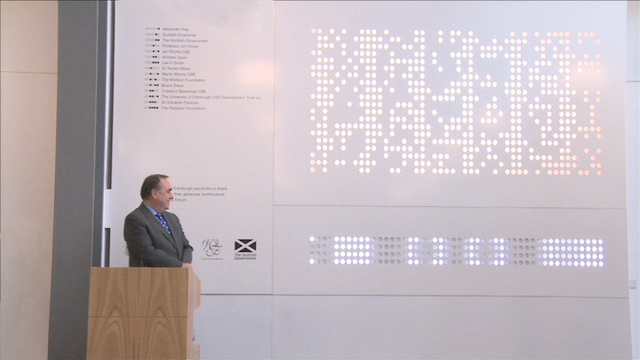 Initially, it will be run for the group by Anne-Marie Scott, Liza Zamboglou and James Stewart. 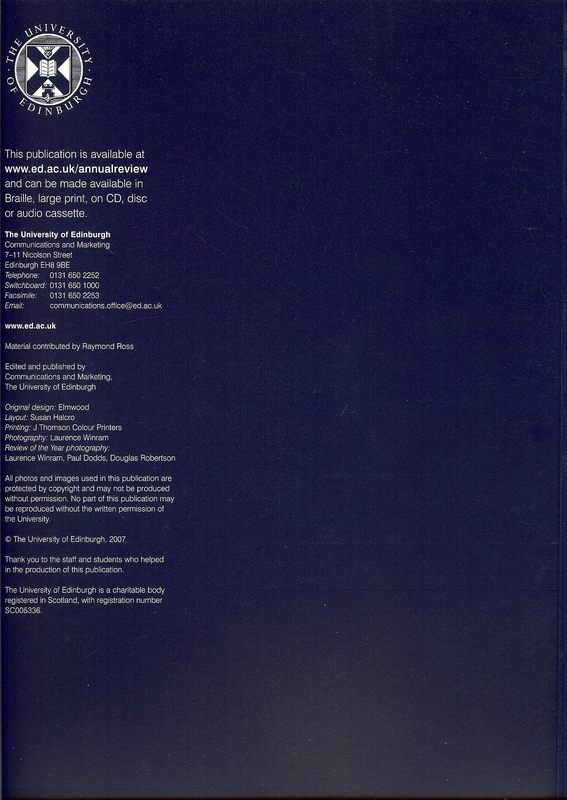 26-Mar-2007 - Top level University domain name vue.ed.ac.uk assigned to group. 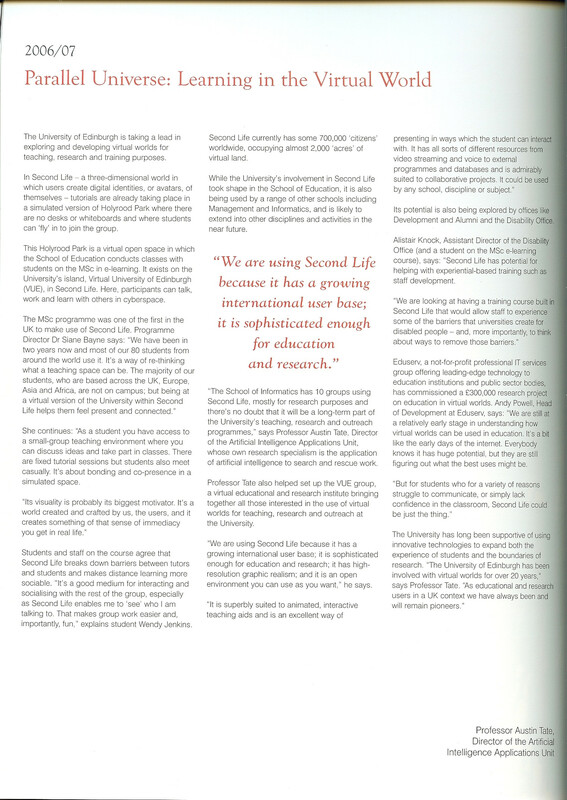 18-Mar-2007 - Vue Mailing List - University of Edinburgh staff, students and visitors may join in the initial mail group. For now, send a request to be added to the list to Austin Tate. 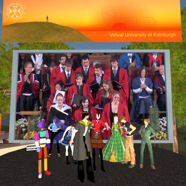 12-Mar-2007 - Vue group established and decision to acquire an University of Edinburgh island in Second Life. 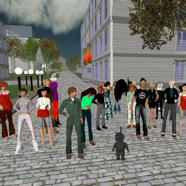 Join in free here and come visit one of the existing Vue project locations in Second Life.